So you wanted to hide a portion of a picture before sharing it out? 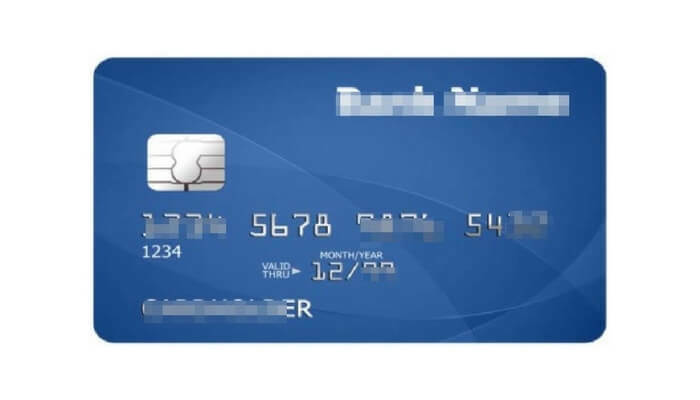 It may be a screenshot you take on a Mac, or a scanned image of your personal ID or credit card. The question is: how to blur the parts that only include private information you don't want to expose? 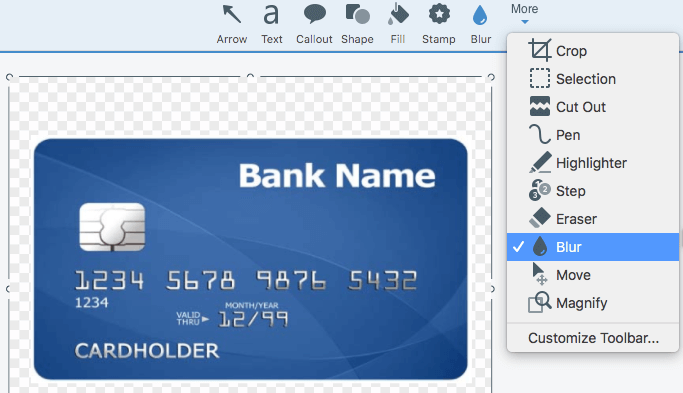 That's what we're going to share with you in this article — 4 quick ways (and apps) to pixelate an image on macOS, without using Adobe Photoshop. 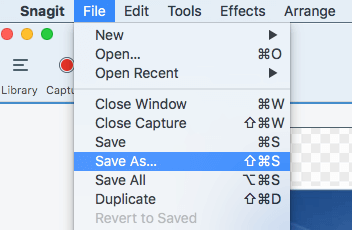 Yes, you read it right, we all know you can get that done in Adobe Photoshop. But, we don't recommend the software in this case, considering the time and efforts you need to invest. Plus, Photoshop isn't free. 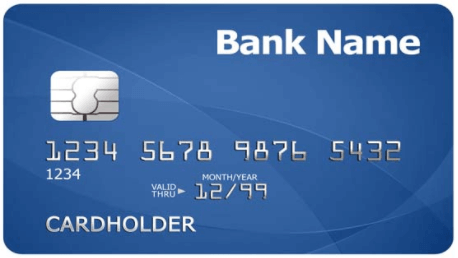 Anyway, I'm using this bank card as an example. Suppose our goal is: hide the last four digits (i.e. 5432) on the card. Below, I'll show you a number of ways to get that done in just a few minutes (maybe less), depending on how comfortable you are with these Mac apps. Preview is a built-in app in Apple macOS. Getting started, double click the picture and open it in Preview app. Note: if Preview is not the default app for open pictures, right click on the image, select "Open With", and choose Preview. Then move your cursor, click and drag to select the area to include the four digits. Hit the "delete" on your keyboard. This will remove the selected area and the digits should be gone. Now press Command + S keys to save the image. Likewise, open the image in Preview first. On the menu, select Tools > Annotate > Rectangle. Now a new rectangle shape will add to the image, adjust its size to cover the last four digits area. You may also need to adjust the color to fully override the area. 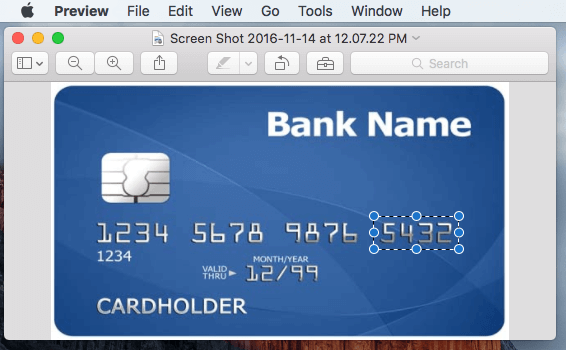 Skitch is a free Mac app made by Evernote that allows you to easily capture screenshots and annotate them. Personally, I feel it's much more powerful than Preview. 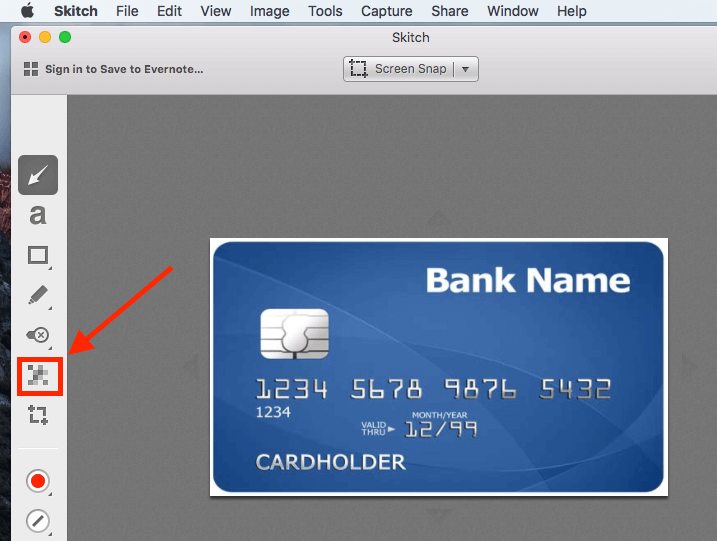 Step 1: Get the Skitch app from its official website here or M﻿﻿a﻿﻿c App Store here. After installation, open the app. On the menu, select File > Open and load the image. Alternatively, you can simply drag the image and drop it into the app zone. 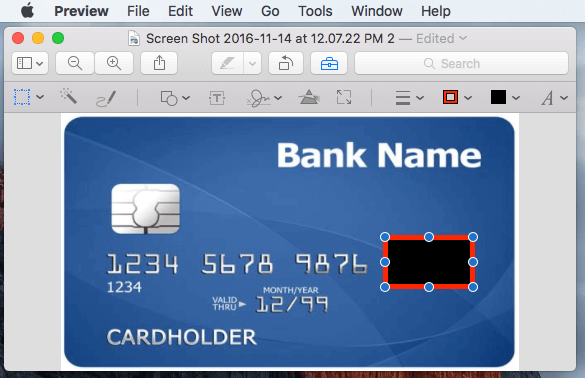 Step 2: Once the image is loaded, click the Pixelate icon on the left panel. Step 3: Left click to select the last four digits area, then release. Now the area will be instantly blurred like this. Done! Snagit is a fantastic app for taking and editing screenshots. Initially, it was designed for Windows only, now it's also available for macOS. Step 1: G﻿et ﻿Snagit﻿ from its official TechSmith site here and install it on your Mac. Open the app and drag the image to the main panel. Then click on the "More" icon, and select "Blur". Step 2: Now move the cursor to the last four digits section, select the area. Soon it'll be blurred out. 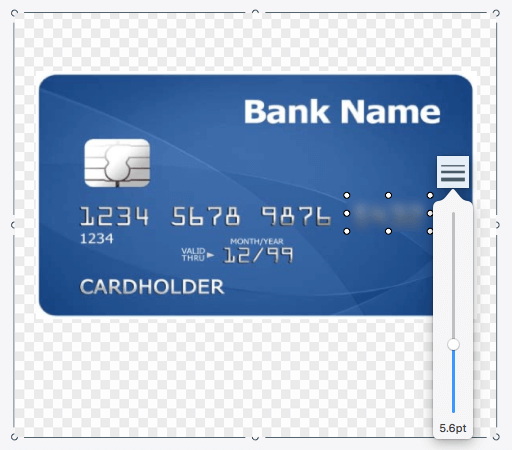 Note: Snagit also allows you to define how "blur" you want that area to be. Simply click on it and you'll see an icon like this, there you can slide the bar to adjust the degree of "blurness". Snagit isn't freeware, but you can try the full version for 15 days without any function limitations. 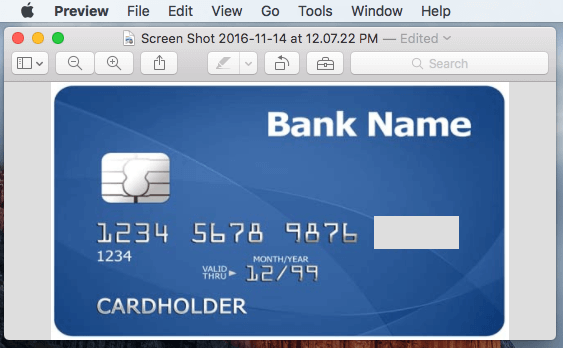 Once the trial period is over, you'll need to pay to keep the app on your Mac. Which method is the best? Well, it all depends on your need and how complex it is. For me, I really like the "Pixelate an image" feature in Skitch because it makes the image look more natural and professional after blurring. 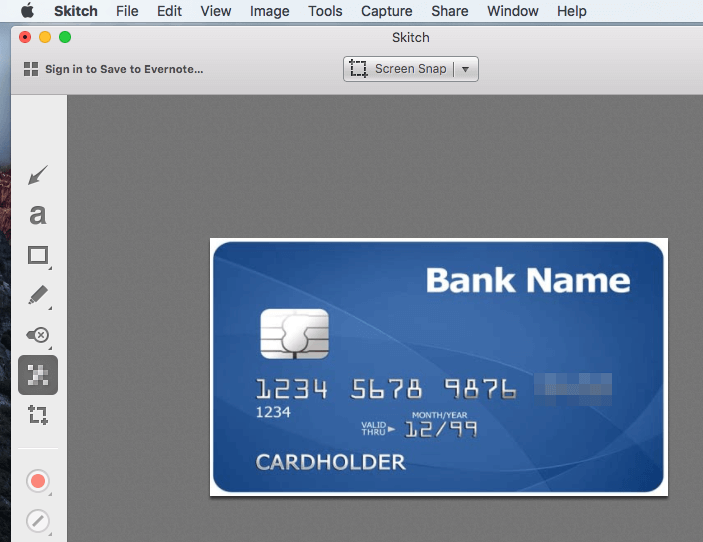 Snagit can do the same thing and the app is more powerful than Skitch in terms of screen capturing and editing. But keep in mind that Snagit isn't freeware though it does have a two-week trial. Mac Preview is also great, especially when you are in a hurry and don't want to download any third-party apps. But the quality of the edited image tends to be a bit low (in other words, unnatural) because of the missing or overriding part. So, choose the method that best fits your situation. Anyways, I hope you find this guide useful. If you happen to know another solution to blur a photo on Mac, leave a comment below and let us know. Chris is a computer geek for a decade. He loved talking to computers via codes, and now he finds it more interesting communicating with the real people. He now writes everything related to computer issues and loves helping people solve problems. Thank you, it really help. Thank you for sharing. I’ve done and could pixelate with Skitch. © 2011-2019 AnySoftwareTools.com | As an Amazon Associate I earn from qualifying purchases.